At a recent Articulate workshop a community member asked me: how do I add multiple cue points to pause a video at several points, which display different slide layers with additional information, without getting my Timeline out of sync? As you can see in the demo, the movie pauses at various points to display additional information which resides on slide layers. When the user clicks the exit button to close a tip, the movie resumes playing. Start by adding your video to your base layer, and style the slide to look however you want. You might notice that when you preview your course, the default setting in Storyline lets users pause and play a video by clicking on it. I don’t want users to be able to pause the video, so to fix this, I put a hotspot on top of the video. Then, right-click the hotspot and de-select “Show Hand Cursor on Hover.” This means users can no longer click on the video to pause it. In addition to creating your base layer with the video, you should also set up your slide layers, which contain the pop-up text information. On your slide layers, be sure to include an exit button which learners will click when they’re done reading the text to hide that layer. Another tip: set the Slide Layer Properties to “Pause timeline of base layer”. This will make sure that the Timeline of the base layer pauses as the Layer is viewed, and should prevent the cue points on the timeline from becoming out of sync. Next, go to the Timeline and add your cue points. 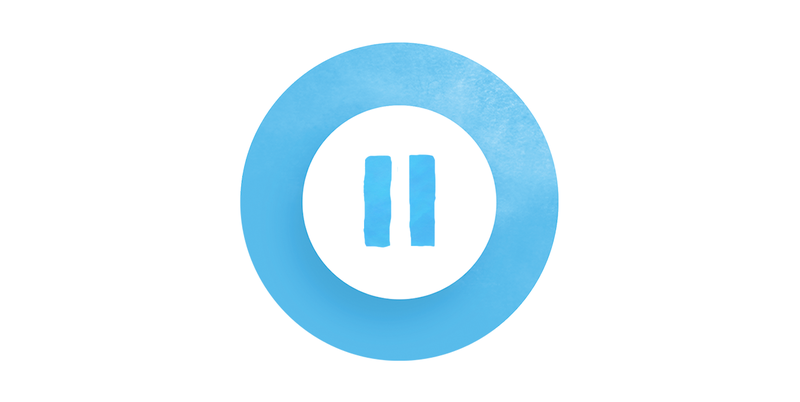 Simply drag the Playhead (the blue line with the upside down triangle at the top) across the timeline to the point in the video where you want the pause to occur. Wherever you stop the playhead, the slide will show you how the video looks at that frame, which helps you determine exactly where the pause should happen. Once you’ve located the right point on the timeline, right-click and choose “Create Cue Point at Playhead” from the menu. This will insert a cue point. Repeat this process until you’ve added all the cue points you need. Now that your slide layers and cue points are in place, it’s time to create your triggers. 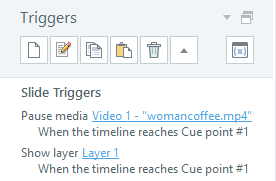 On your base layer with the video, add two triggers for every cue point you’ve inserted: the first will pause the video when the Timeline reaches the cue point, and the second will display the associated slide layer when the Timeline reaches the cue point. Add both of these triggers for every cue point on your Timeline. 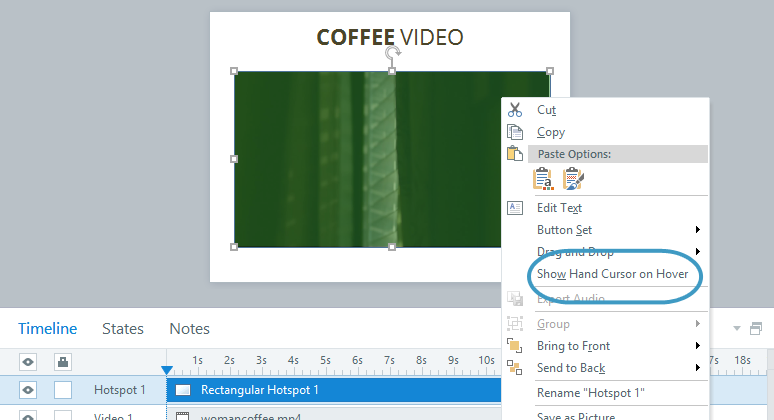 Next, for every slide layer, add two triggers to each exit button you added earlier. The first trigger will hide the layer, and the second will play the video. 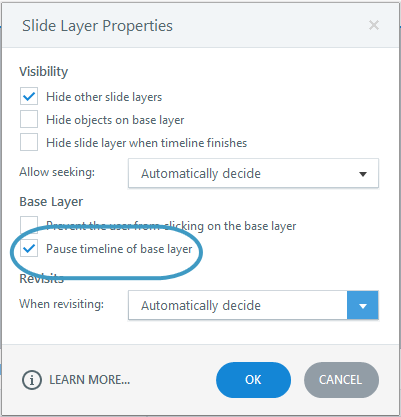 Since you’ve set the Slide Layer Properties to pause the timeline of the base layer, the video should resume exactly where you left off when you close the slide. And there you have it! This three-step process should help you achieve the functionality you wanted. Do you have other favorite tips or tricks to pause videos and display new information? Do you prefer to use a hidden state, or a new slide layer, or something else? Let me know in the comments below! Wow! This is simple and very effective. I can also see how a using cue points and a slider could be used to jump to specific points in the video. The "Pause timeline of base layer" is one of my favorite features for any media! This is great- Thanks! It is a great feature indeed, Rose! Thanks Nicole, I presume this could be done for an audio file instead of video if you want a custom mute & show transcript button option? Absolutely! You would just select the media type to be your Audio file instead of the Video. Easy peasy! thank you so much! this helps with what I am trying to do right now. I do have a question: what if I do want the student to be able to pause the video at any time. My video is quite long (it's a class) and i would like them to be able to pause at any time they need to if they have to step away. thank you in advance! Amanda – I have the same question. I would also like allow users to pause the video at their convenience. If I turn on the show video controls, the video pauses but not the timeline which will make the cue points and the appearing of the layers out of sync with the video. If I use the seek bar on the slide itself instead of the video controls, the user can adjust the volume within the course and pause the timeline in addition to the video -- which is nice. However, the downfall to using the seek bar is that it always looks a little funny if you’re using layers to do something similar to this example since the layer has its own timeline. What would be great is if it were possible have the option of continuing to show the base layer seek bar instead of showing a separate seek bar for each layer. Does anyone have any thoughts on this? Thanks for the suggestion! Am I correct that it looks like you are hiding and showing objects on the base layer instead of using a separate layer? I just used this as a solution to a course I am working on. Thank you so much!! I have a video that starts when a student clicks on a hot spot. Can I make a cue point to the video time when it will never be in sync with the slide's timeline? I want captions to appear at certain points in the video. You just saved me a days worth of working fixing my last class. I'm guessing there's no way to do this with a YouTube video. I don't think there would be any way to set the cue points. I've been trying to do something like this for several days. My video file is 17 minutes in length and is 26,252KB. Storyline will not sync up the timeline to the video. I think it has to do with my PC's processing power or the size of my video that I've inserted into the module. As it is now, if I move the blue line on the timeline, it moves to the first spot I drop it, but then never shows me any further. For instance, I need to drop cue points at 140seconds, 354seconds, 450seconds, 652seconds and 932seconds. My video is frozen somewhere around 65seconds. Is it an issue of size or processing power? I experienced the same problem with a one minute video from the Content Library. I could move the playhead to about 23 seconds but when I moved it further I couldn't see what the video was showing at that point. It was still frozen on the frame at 23 second mark. I'm using a Microsoft Surface Book. I've figured out a workaround that mostly works :) When I dropped the video on the slide, it created a timeline that was significantly longer than the actual video so that contributed to part of the problem. No idea why the timeline would stretch out like that. I was able to create buttons with state changes and I manually aligned those to cue points -- lots of testing and back and forth since I am unable to preview the video (just doesn't work). I also took the advice of pausing the timeline of the base layer when each of my layers were accessed from the button click. Now I just need to figure out how to keep the timeline stable when someone scrubs the video controller. That's an issue for another day. Steve, I think that you would just download the YouTube Video, insert it into your project, and then add your cue points within your project file. I've found that another very useful setting that should probably be included with this type of interactive video, is to ensure that the Slide Properties for the Base Layer slide containing the video, is set to "Reset to initial state" when revisiting (on the cog wheel, bottom right). I discovered when creating this type of content that if a user started viewing the video, exited before it reached the end and then went back to view it again, the video would continue playing from where it left off, but the intervening time spent away from the video would be counted on the base layer's timeline. This completely destroyed the synching of the cue points (and hence the appearance of subsequent messages on the layers). I tried all manner of means to try and get the video to reset so that it started from scratch again in these circumstances, including adding a trigger to restart the course if the user clicked the exit button to leave the video, but nothing worked satisfactorily until I changed that Slide Properties setting. Now there are no more issues. Another important consideration is not to add the Video Controls (the Play / Pause / drag to Fast Forward or Rewind bar) to the video, as if a user does any of those it will throw out your cue point / timeline synching completely. Amanda and Maria, I had the same need. 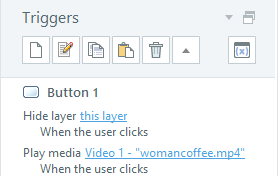 What I did was to add a control button to the base slide containing the video, with the following triggers: 1) pause the timeline on the base layer when the button is clicked (on condition that its state is Normal, i.e. it hasn't been clicked before the video starts playing - I have a start button superimposed on top of the video that must be clicked in order to start the video, so that the user can start it when he/she is ready, and I don't want the user to start playing the video through the Pause button while the Start button is still superimposed on top of it), 2) resume the timeline when the button is clicked again (on condition that its state is Visited), and 3) to change the button's state back to Normal once it is clicked if its state is Visited (but that is just to be fancy, as the wording on the button changes from "Pause" in its Normal state to "Play" in its Visited state). As it is, each time a cue point is reached the video pauses automatically while a message is displayed, but adding this button too also allows users to pause the video at any other time of their choice. Hi Folks, I am trying to access the video but unable to do so. Please suggest. Hey folks, what's the best way to pause a video I recorded in storyline 3 for three seconds, then start automatically?